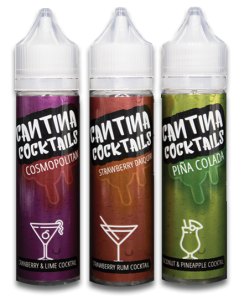 This Cantina Cocktails 180ml Bundle will land you one of each in the range with nicotine shots included! All in all we are quite proud of these flavours and can’t wait for everyone to try them. We are certain that every juice in this range can provide a delicious all-day-vape. 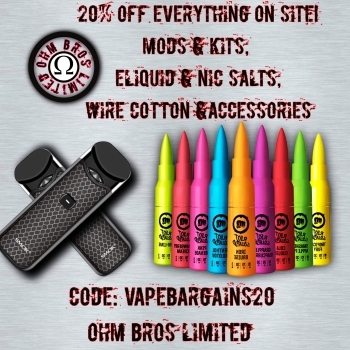 In addition, we have personally tested every liquid on various atomisers, from humble tanks to rebuildable mechs, and are confident that Cantina Cocktails will have something for everyone! See the flavour descriptions below! Along with the strawberry is the rum and sugar, which brings a mouth-watering sweetness. In contrast to this is a subtle lime flavour that makes sure this juice never gets sickly or heavy. Moreover the mix in Strawberry Daiquiri will have you convinced and leave you wanting more! Drip this e-liquid into your favourite atomiser and experience a true Piña Colada. First you taste the delicate coconut which quickly evolves and becomes rich and creamy. Second to come through is the pineapple, tart and juicy with nuances of tropical nostalgia. The whole time notes of rum are present, woven throughout the silky flavours. Just be careful you don’t get caught in the rain! This e-liquid brings a perfect balance to its profile. With succulent and ripe cranberries that include a tart bite that’s not too overpowering, and luscious oranges and a hint of lime which adds a citrus taste. Because of this partnership between sweet and bitter, Cosmopolitan is incredibly refreshing.